Are We More Invested In Bringing People to Church? Or to Jesus? Church attendance should be a tool to help people draw closer to Jesus. Not the other way around. As a pastor, I have too much invested in getting people to attend church. My salary depends on it. My reputation depends on it. My sense of self-worth depends on it. All to a much larger degree than I’m comfortable with. Come to Church? Or Come to Jesus? The way most church systems are structured, many pastors have a greater stake in getting people to come to church than getting them to come to Jesus. In fact, sometimes it’s detrimental to our bottom-line to have people draw too close to Jesus. But we have to do it anyway. We have to point people to Jesus more than to the church. But I have a longing. For more. For better. For deeper. I want to live, preach and disciple people in such a way that they’re committed to Jesus, not just their church. Of course, church is valuable. It matters that we participate in a local body of believers through worship, fellowship, discipleship and ministry. If it didn’t matter, I’d leave the pastorate today. We’re not commanded to bring people to church. We’re commanded to disciple them into a deeper relationship with Jesus. But we’re not commanded to bring people to church. We’re commanded to disciple them into a deeper relationship with Jesus. Church attendance is not the goal. It’s a tool to help us reach the goal. As a pastor, I have to remind myself of that on a regular basis. I don’t want to pastor a group of nice, polite church attenders, or waste my time entertaining bored believers. I want to participate in the gathering, training, and releasing of an army of Jesus-worshiping, people-loving, barrier-breaking world-changers. Sometimes it feels like my salary depends on the former. My integrity depends on the latter. I also want my bills paid. But making pastoral decisions that have more to do with holding on to our salary packages than making disciples has made much of the western church anemic. The church I pastor is no exception to that. At least not as much of an exception as it should be. That’s not their fault as much as it is mine. Jesus promised that if we serve his kingdom first, “all these things” will be taken care of. Let’s trust him to do that and turn the church loose. What is your passion? What gets you out of bed even on the bad days? When I was a teen, I probably would have thought of such questions as irrelevant or even dumb. I was driven to get good grades, but I was probably just as passionate about eating ice cream or playing basketball. Although my youth pastor and many other speakers urged us to share our faith with our friends, I think I was mostly focused on trying to not look stupid – unsuccessfully, by the way. I knew I should be passionate about winning my school and city for Christ, but I was actually much more excited about my baseball or football team winning it all. More than two decades later, I’m in a different place. Don’t get me wrong: I get pretty pumped about the Kansas City Royals finally winning some games, and I’m unequivocally passionate about slow-cooked, barbecue pork ribs. But those things do not drive me. There are two firecrackers that now wake me up every morning with an explosion louder than any alarm clock: Christ and his mission. I am consumed by God and want everyone in this world to know Him! Yet, even with those forces propelling me, why do I sometimes allow my focus to be so often on lesser things? Place. If you’ve ever tried to broach the possibility of moving church structures or allowing another congregation to use your facilities, you know the physical location is important to people. Personality. The dynamism and the talents of many leaders attract and inspire. When we feel most attuned to God and his kingdom, sometimes we are actually connecting with a certain leadership style or personality. This is why members frequently leave a congregation when there is a change in leadership. Programs. “They have a great children’s department.” “I love singing in the choir.” Programs help us and our families fit in and involve ourselves in ministry. People. Think about five favorite friends that are part of your local church. Praise the Lord for meaningful relationships like those! At the same time, if those five people were to suddenly not be a part of the congregation, would that adversely change your attitude? To clarify: none of these “connector categories” are bad at all. Our facilities are a great blessing, and we would rather have charismatic, personable leaders than not! A church with no programs at all is a virtual impossibility, and people loving people is the definition of Christian fellowship! Nevertheless, I agree with Mancini when he says that all of these are lower-level visions. None of these should be goals in themselves. If we fail to move our focus beyond these four areas, we will never see upper-level multiplication dreams come to fruition in our churches. That term: “upper-level dreams,” reminds us of a few upper rooms, does it not? In one upper room we see in John 13 that Jesus takes the towel and basin and washes his disciples’ feet. His time is short and he chooses this powerful means to “show them the full extent of his love” (v. 1). The focus in that upper room? Service. Love. Christ. Acts 2 tells us of another upper room. Nearly two months later, the resurrected Jesus sends his Holy Spirit upon 120 of his followers and they are deployed into Jerusalem and the world with the multi-lingual message of repentance and hope. The emphasis in that upper room? Unity. Wind. Mission. You see, when we dwell in the upper room, we begin to have upper-level dreams. We do not focus on the petty or trivial. We are overcome with things of eternal significance. Place, personality, programs, and people have their moments. But what connects us and compels us in the day-to-day is the work of Jesus Christ in us, among us, and through us. I spent my teenage years as a good Christian boy. I liked church and I for the most part made good decisions. But if I had to do it over again, I would get out of the lower level and start to dream upper-level dreams. What about you? Is your focus on lesser things, or are you obsessed with Christ and his mission?! May we hesitate no longer. 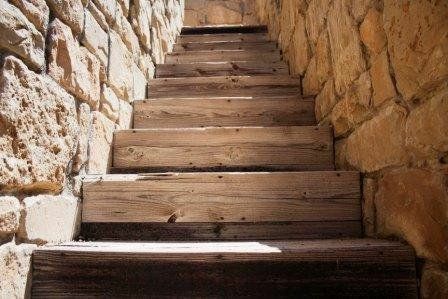 Let’s intentionally walk up the stairs to the upper room. I recently spoke with a church-planting leader for a particular denomination. As we talked over coffee, he inquired about the direction of our church when it comes to church planting. My response was to describe our future missionary labors in terms like we read about in Acts 13-14; 16; 20; 1 Thess. 1:2-10; and Titus 1:5. He responded with much surprise as if my thoughts were coming from an unusual source. Unfortunately, over the years, I have found myself surprising many people during similar conversations. What does it reveal about our missiology and biblical convictions whenever we think it is strange to advocate that those first century church planting teams have something to teach us? What does it reveal about our Kingdom stewardship when we view such an advocate as being peculiar? Do we not recognize a problem exists whenever we label a church planter as being innovative, creative, or unusual for following a Pauline model? Granted, not everything we read in the Bible is prescriptive. However, I believe our brother Paul and his example should be on a pedestal for us to consider. He was a church planter, you know. As wise stewards of the mystery of Christ, we must subscribe to a definition of biblical church planting as evangelism that results in new churches. Or, to communicate it in other terms: disciple-making that results in new churches. The weight of the biblical model is on this definition. Imagine what would happen if we began to create a church-planting atmosphere in North America whereby the expectation for new churches is that they should consist of 95-100% new believers–at the moment those churches are planted. Consider what would happen if our strategies did not embrace methods that would result in new churches consisting of 95-100% long-term Kingdom citizens – at the moment of their births. We have no idea how big the Universe is. The farthest thing we have measured so far with the help of a mighty telescope—actually two telescopes: one in Hawaii and one in outer space—is 13 billion light years away (a light year, by the way, is 5.88 trillion miles). So the farthest thing that we have measured is 5.88 trillion miles times 13 billion. That’s A LOT! Somewhere in the middle of this vast universe is a spiral galaxy called the Milky Way—which is made up of hundreds and billions of stars. One of those stars is our sun—rotating around the center of the Milky Way once every 250 million years. One of the planets circling our sun is a tiny little ball called planet Earth. Our tiny little ball of water and dirt, planet Earth, is only 8,000 miles in diameter and orbiting a tiny star on the outskirts of the Milky Way in this vast, vast universe. And you and I are just two of the 7.4 billion people on this tiny, tiny planet. Let the truth of those words sink in. God didn’t even lift a finger—to create this massive, blowing your mind, huge, vast, incredible universe. Speaking, speaking, speaking…and it came into existence. God is more massive than our wildest imagination. BIGGER than the biggest words we have to describe Him. He shows no sign of wear and tear. God does whatever God wants. His purposes are a sure thing. No cutting him off at the pass. God knows everything and everyone. There is not a bird flying on this tiny little planet or perched on a little, little branch that has escaped his vision. He could start with Adam and name every man, woman, and child who has ever lived and tell you every tiny detail of their lives. Nothing is hidden from him. He doesn’t have to wait for a polygraph test to decipher the truth. And he fashioned us with the ability to know him. The really, really Good News…He loves you! Maybe you just flunked your first test of your college career and He still loves you. You… who got so angry for no reason at your spouse last night… and he still loves you too. You… who just let somebody down… yup, he loves you. You are one of 7.4 billion people on this tiny little planet on the outskirts of the Milky Way. knows all your deep dark secrets, and he still loves you! And can rescue and redeem and refresh and renew and revitalize you! Does anybody need that today? Smoke went up when I said “Yes” to God’s call into full time ministry. It wasn’t a “white-smoke-out-of-the-chimney-like-when-they-elect-a-pope” kind of smoke; it was more like a “too-much-wet-wood-on-the-fire” kind of smoke. I was sitting beside a campfire on the Church of the Nazarene’s Eastern Michigan District Campgrounds at a teenage “afterglow” following a campmeeting service when I first thought that God was calling me into some kind of Christian service. I was in the seventh grade. I didn’t see any writing on the walls. (We were outside—no walls). But I knew deep into my bones that God was calling me. Why would God call me to ministry? I had never spoken publicly. I was a pretty squirrely, 75 pound, weak-hitting little league second baseman. I really was not skilled at much of anything except collecting baseball cards and annoying my siblings. Still I knew that God was calling me. I didn’t know that the calling would lead me to Olivet Nazarene College (University now) and Nazarene Theological Seminary. I would have never guessed I would serve on the pastoral staff of a Presbyterian church while in seminary and Nazarene churches in Alanson, Bad Axe, Roseville, and Otisville, Michigan and now in Lenexa, Kansas. I didn’t know that I would be able to preach not only in the wonderful churches that allowed me to stand behind their pulpits each week—but I have had the privilege of also preaching in Dominica, Russia, El Salvador, Swaziland, Israel, Jordan, and now Cuba. I cannot adequately describe for you how blessed I have been in my life since saying “Yes” to God around that campfire. There was no smoke that went up in my office at the Metropolitan Church of the Nazarene when God called me to write. Again, I didn’t see any writing on the walls (there were walls there—but no writing on them). I didn’t hear an audible voice. But once again, I knew deep in my bones that God was calling me. Why would God call me to write? I’ve written a few articles here and there in publications that just about no one reads. In fact, one magazine that published an article of mine is now defunct; and another one, after publishing several of my articles, has gone to an on-line only version. I don’t think I’ve been kind to the publishing world. Mr. Pulitzer has not been recommending me for any writing assignments. In spite of that history (possibly with fear and trembling), the Nazarene Publishing House has agreed to publish my book, Following Jesus with a Migraine. I will be signing the contract today. I am not sure when the book will be released. I am not sure if anyone will actually read it. Here’s what I know: God called me to write− and this book in many ways is a fulfillment of that call. I didn’t know that I would experience a brain hemorrhage to give me a topic on which to write. I didn’t know that it would be fifteen years after sensing that call that an actual book would be written. I just knew that God called, and for me to be obedient meant I had to write. Maybe God is calling you to something that you are not technically qualified to do. Maybe it’s something you think there is no way you could do. Maybe you think you are too young, too old, too uneducated, too busy, too overworked already to accomplish God’s calling. Maybe it will take some time before the calling comes to fruition. (It was 15 years for me− remember). Maybe other factors out of your control will happen. (I had a few chapters lost when my computer crashed a while ago). But if you are called by God to some task and you know it deep in your bones—don’t worry about the reasons why you can’t accomplish God’s plan. Just do it. Follow that calling! I love what Jeremiah said when he knew God was calling him to speak. He wrote: But if I say, “I will not mention his word or speak anymore in his name,” his word is in my heart like a fire, a fire shut up in my bones. I am weary of holding it in; indeed, I cannot (Jeremiah 20:9). If God is calling you—and you can’t hold it in, you can’t let it go, you can’t do anything but follow the calling— then follow it! Will there be challenges ahead? Probably. Will you be tempted to quit? Maybe. Will it be easy? Nothing great usually is. Still, God has great things in store. When He calls—He enables and empowers you to realize that calling. If God is calling, He will make a way for you to achieve what He is calling you to do. There might not be smoke rising when you say “yes”—but then again maybe there will be. God gives us fresh songs of praise. God is in the heart-transplant business. In the driest wilderness, God’s refreshing fountain springs forth! God changes minds, attitudes, and entire selves so that we are like him! God truly makes ALL things new. In Christ, God gives us a fresh start. The new beginning does not have to wait – God’s mercies are new every morning! Even at the end of the story, God starts another one.